Christmas in Sofia, Bulgaria. Photo: SetTimes. Each year during Christmastime, I begin a new journey "In Search of Christmas" to discover how Christmas is celebrated in various regions of Europe and to bring these Christmas tidings to you! This year, my Yuletide chronicles take us to the eastern-European nation of Bulgaria to uncover their time-honored traditions. Unlike most European countries, Bulgaria is not known for its festive Christmas Markets [yet], but there are fascinating customs observed here as I have recently discovered in an impromptu interview with a resident and new friend, @Kristian_Mitov. It all started with a simple question on Twitter, "has anyone celebrated Christmas in Bulgaria?" Kristian replied "many times." At that moment, those two words spoke volumes to me and I knew he was going to be able to open a new window into the world of Christmastime in Bulgaria. I must admit I had a lot of fun talking with him especially when some of our exchange got lost in translation as you'll read below. Join me as we discover the sights, the sounds and the flavors of the holidays in Bulgaria. 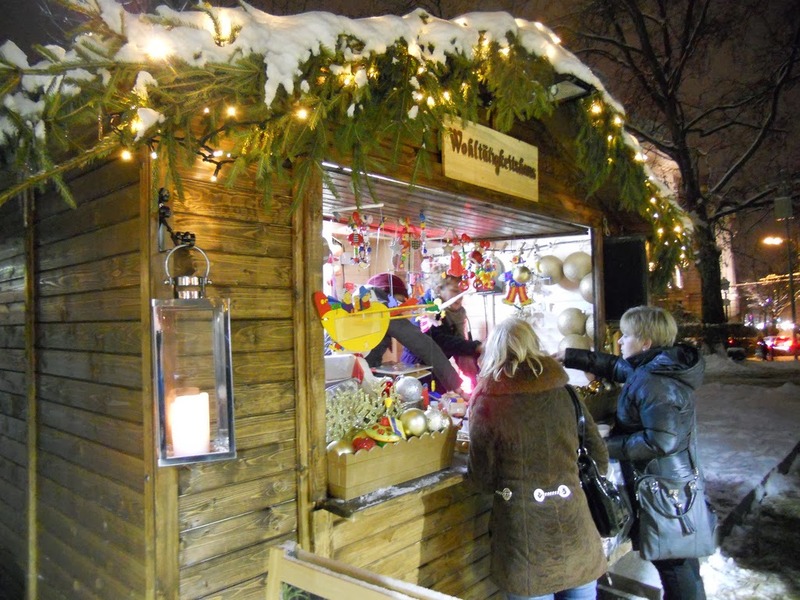 Bulgarian Weihnachtsmarkts or Christmas Markets are finally catching on throughout this Eastern Orthodox nation. Photo: IrinaYakimova. Before we get started, let me introduce you to Bulgaria. Perched on the western shore of the Black Sea and smack dab in the heart of the Balkan Peninsula, Bulgaria is an Eastern Orthodox nation known mostly for its mountain hiking and Black Sea beaches in the warmer months, and its skier's paradise in the wintertime. 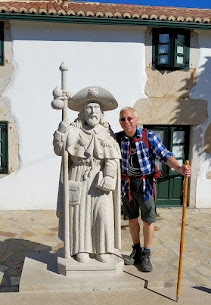 Plus there is much history to discover here in its portfolio of churches, monasteries, Roman ruins and museums, not to mention the Eastern Orthodox traditions celebrated of which I knew a little bit about until now. Back to my interview. 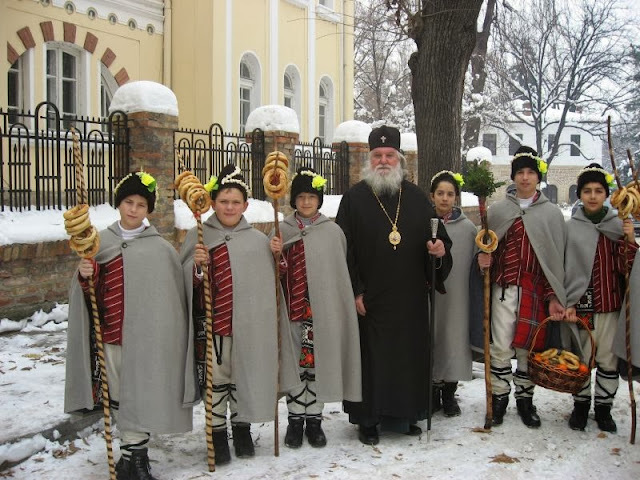 My first question to Kristian was how do Bulgarian Orthodox people celebrate Christmas? To my surprise, Kristian replied that Easter is a much bigger holiday in Bulgaria than Christmas but he emphasized "that there are many cool Christmas Eve traditions." I then asked if Bulgarians followed the Gregorian calendar with Christmas falling Dec. 25 or the Julian calendar with Christmas falling Jan. 7. 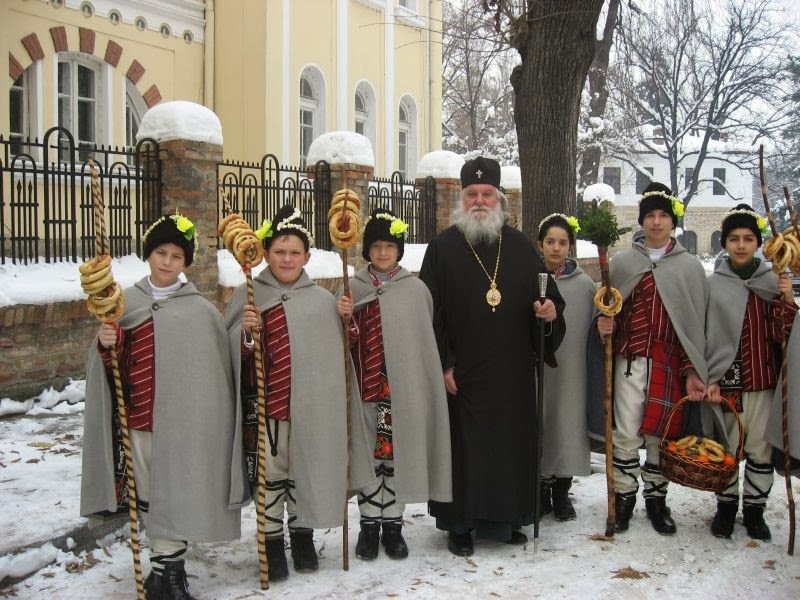 As it turned out, Bulgarian Orthodox follows the Gregorian calendar and so the celebrations commence Dec. 24. The honor of hosting Christmas Eve rests with the eldest Grandmother and families gather for a feast consisting of an odd number of "fast-food" dishes with no fewer than seven. "Fast food," I asked? Of course I immediately thought of McDonald's but Kristian explained that "fast food" is "fasting" food with no meat, cheese or dairy being served for the 40 days leading up to Christmas. What do they eat? Delicious looking homemade round breads, bean soup, stuffed peppers and pumpkin cake round out most of the dishes served. Kristian also added that Christmas Eve is known as "Badni Vecher" in Bulgaria because of a special type of wood burned in the fire place called "Badnik." He later added that if I really wanted to celebrate a traditional Bulgarian Christmas, I should find myself a grandmother living in the mountains who has been cooking for the entire day. Doesn't that sound inviting?! And as I found out, I should do just that since most, if not all restaurants will be closed for the holiday. Kukeri festivals are celebrated throughout the Balkans. Photo: WikiMedia.org. "Kukeri" festivals are celebrated throughout the Balkans where the residents don their holiday best, or rather frightening looking costumes with wooden animal masks and bells around their wastes, and march or dance down the streets to scare off the evil spirits. They also bring good harvest, health and happiness to all the people. Mostly seen under the cover of night, they visit people in the homes first and later gather in the squares to dance. 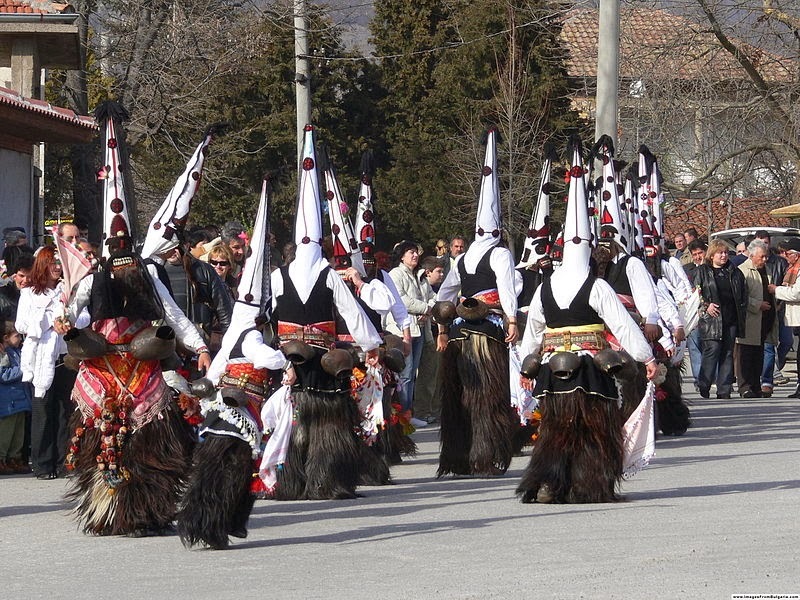 Balkan residents transform into "kukeri" to fend off the evil spirits. Photo: WikiMedia.org. Koledari carolers travel at midnight on Christmas Eve to spread the word of Christ and wishes for peace, health and happiness. Photo: Bashkiria.Bulgaria.wordpress.com. But Kukeri are not the only ones visiting the residents to spread holiday cheer, for there is another, the "Koledari." The Koledari carolers are young boys who travel from house to house at midnight on Christmas Eve to spread the word of Christ but also to spread wishes of peace, health and happiness to all. Not only do they bring tidings of good joy, but gifts of food in the shape of round breads, similar to bagels, carried at the top end of a stick called a "gega." Speaking of Koledari, the newly established Christmas Market in Sofia since 2009 is known as the Koledaria and is held in Borisova Gradina Park. 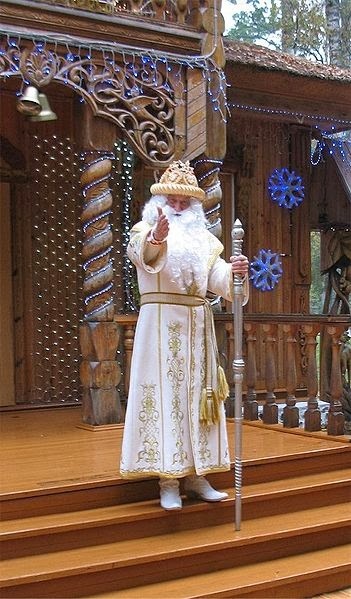 While under Communist rule, Dyado Koleda became the secular Dyado Mraz (Grandfather Frost). Photo: WikiMedia.org. And finally, the jolly old man in the red suit, aka Santa Claus, is known here as Grandpa Koleda or Dyado Koleda (Grandfather Christmas). While most of the Santa traditions are similar, there was a time during communist rule when Dyado Koleda was secularized into Dyado Mraz (Grandfather Frost) without the attached Christian traditions, and this new version of Santa became quite popular with the communists. Instead of delivering gifts under the cover of night on Christmas Eve, Dyado Mraz ventured out during the day where he could exchange greetings with the little ones. Not until 1989 did the Bulgarians welcome back Dyado Kodeda. 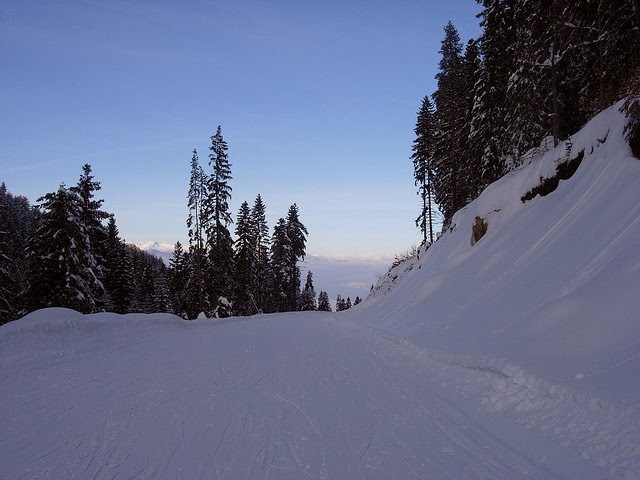 One of the most popular winter destinations in Bulgaria is the Bansko Ski Resort. Photo: Mathatbat. When I asked Kristian where residents and tourists visit during the holidays, he mentioned that the main attraction is skiing in Bansko or Sofia. But there are a few other places to visit as well. 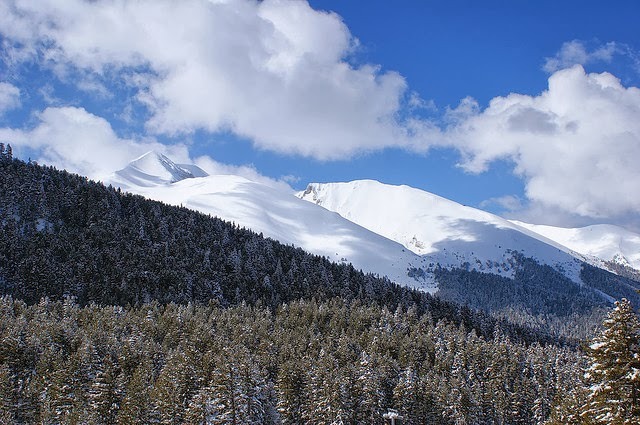 Pristine trails await in Bansko. Photo: Rat1. The Saint Alexander Nevsky Cathedral in Sofia dates back to 1882. Photo: WikiMedia.org. Named after the Russian prince Alexander Nevksy and dedicated to the fallen soldiers of the Russo-Turkish War of 1877-78, the Saint Alexander Nevsky Cathedral dates back to 1882 and is the cathedral church of the Patriarch of Bulgaria. 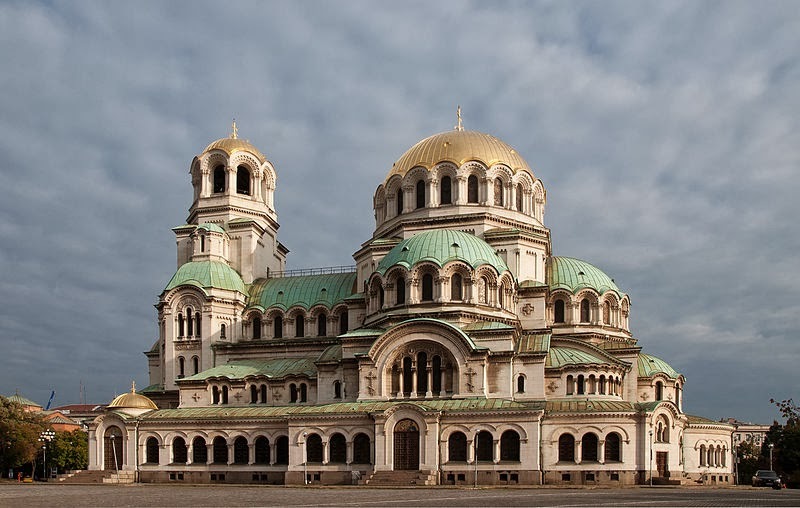 Not only is it one of the largest Eastern Orthodox cathedrals in the world, it's the second largest on the Balkan Peninsula after the Saint Sava in Belgrade. Once inside, Saint Alexander's interior will take your breath away with its lavishly decorated interior spaces covered in Italian marble in practically every shade and color. Be sure to look up at the interior of the central dome where you'll find the "Lord's Prayer" inscribed in gold. Remarkable! Located on the outskirts of Sofia, The Boyana Church, a UNESCO World Heritage site, is part of a compound that consists of three buildings with the first dating back to the 10th century. Inside, 13th-century frescoes decorate the interior spaces and comprise one of the most significant collections of medieval art today. The 10th-century Rila Monastery was founded by Saint Ivan of Rila but built by his students. Photo: WikiMedia.org. Also on the UNESCO list, Bulgaria's largest and most famous monastery—the Rila Monastery dates back to the 10th century as well. 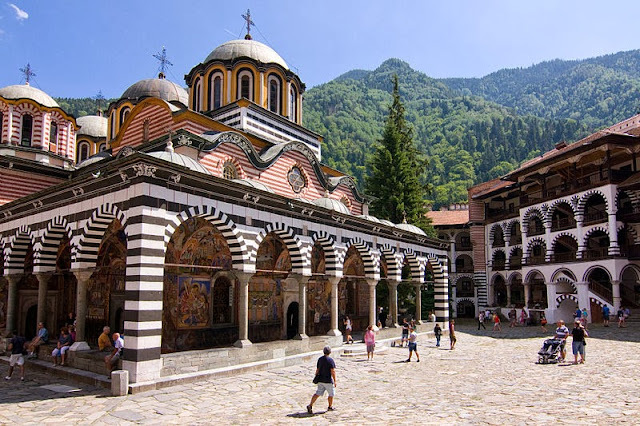 Founded by Saint Ivan of Rila, a hermit who lived in a cave nearby, the Rila Monastery was actually built by his students who came to the mountains to study. Baroque Bulgaria is alive and well in Old Town Plovdiv. Photo: WikiMedia.org. Welcome to 17th-century Baroque Bulgaria! 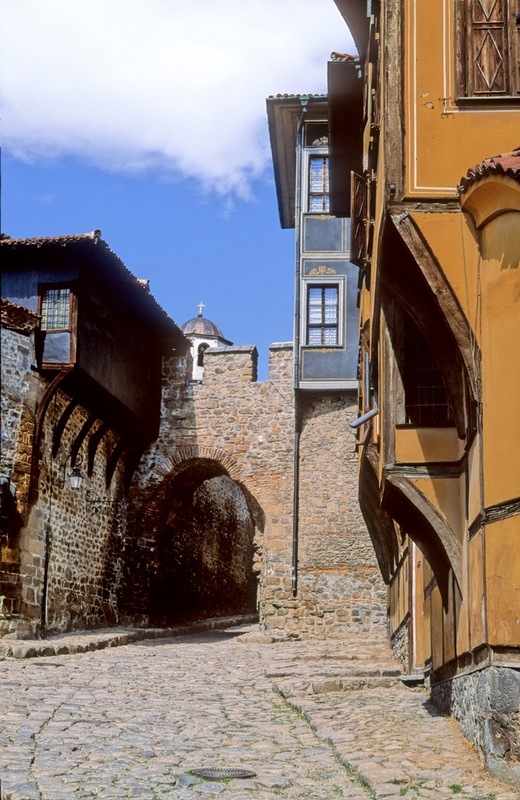 Built in the 19th century, Old Town Plovdiv is a living museum of more than 150 houses comprise that comprise an architectural collection of buildings from the National Revival period or the Bulgarian Renaissance which took place from 1762 to 1878. It was during the Revival when Plovdiv emerged as as a major economic center and with that, came the wealthy merchants who designed and built elaborately decorated homes which grew more whimsical as the Revival period got underway and the lavishly ornamented with marble, bay windows, Turkish baths and ornate furnishings. I hope you enjoyed this Christmas journey into Bulgaria and learned something new or discovered that you too share a similar custom or tradition in your homes during Christmas. Looks like I should put Bulgaria on my 2014 Christmas market list. Beautiful pics of the city and country. I love Dyado Koleda, too. Hi there Cathy and thank you so much for stopping by. Remember, not many markets in Bulgaria yet but I suspect they'll become increasingly popular as time marches on. Thanks for your kind compliments too! I love learning how Christmas is celebrated in other countries and it's particularly interesting to see the changes that were made during Soviet rule. And I would really like to know how many Alexander Nevsky Cathedrals there are in Eastern Europe - there seems to be one everywhere! Hi there Lisa and thank you so much for your persistence in leaving a comment. I apologize for the challenges presented earlier. I share your passion of learning how Christmas is celebrated in foreign places and also found the changes during Soviet rule just as intriguing. I had to laugh at your comment about the Alexander Nevsky cathedrals ... there are many and surprisingly enough, in the U.S. as well. After all Orthodox Christianity is spread all over the world through the Orthodox immigrant communities. 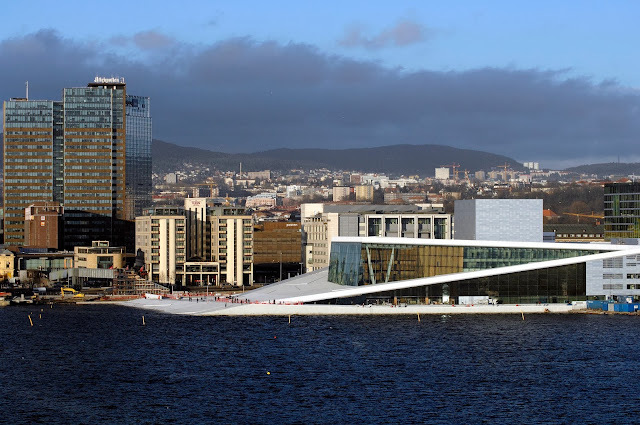 Thank you so much Kristian for sharing this with our readers. It's great information. HI there Jo. Thank you so much for offering up this tip for those of us who won't be traveling to Bulgaria. It's a wonderful option! A young friend of mine was recently released from hospital here in Denver after a long recovery from a terrible accident. My wife and I got to know and love her through a Bulgarian connection, and visited her often. She went back home to DC to complete her rehab. She is Bulgarian, and her mother came to the US to assist in her recovery. I know they will love the Revels from what you described and her homesick mom will thank you always. I'll forward your information to them and -- Thank You! Thank you so much for stopping by to share your story. First of all, I am relieved to hear that your friend has recovered. Thank God!! And thank you for sharing my article with them! I hope they too find it as enjoyable as you. Thx again. Thank you my friend for stopping by and for your kind words! What an interesting post Jeff. I know next to nothing about Bulgaria so find some of the customs fascinating. I wonder why poor tired old granny gets all the work - doesn't seem quite fair to me. Interesting tradition with the carolers delivering what looks like bagels too. It would be an interesting country to visit around Christmas. Hi there Leigh!! Thank you so much for stopping by. Each year, I do one or two of these posts to add to my "In Search of Christmas" series for that very reason, to learn about the customs and traditions of those who live there. Connecting with people is key to really understanding cultures as you know, so unless I can interview first hand, I won't attempt an article until I do. Thank you Kristian for sharing that with Leigh! And thank you once again for all of your help with this article! I love your Christmas series, Jeff and I really enjoyed learning about Bulgaria. 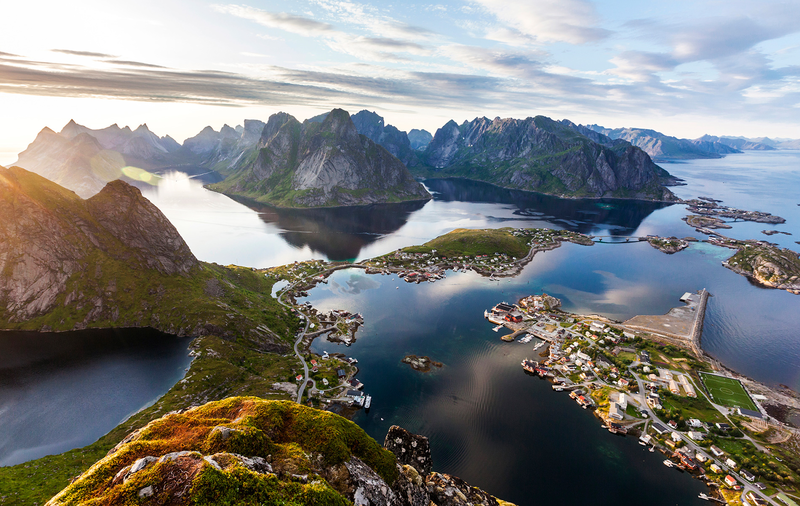 It's such an under-the-radar destination that I'm now fascinated to learn more of. What great traditions and a joy to know Santa/Grandpa Christmas is here too. I kind of like the idea of him being able to talk to the kids during the daylight instead of being shrouded in mysterious nighttime visits here.The Rila Monastery is stunning! 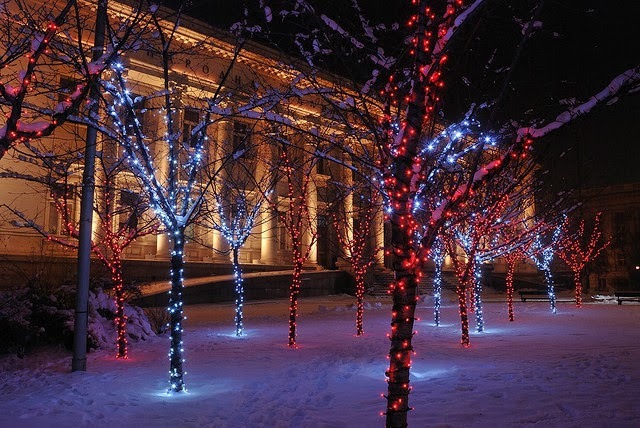 Brilliant idea to travel and see how other countries celebrate Christmas. Lovely pictures too. I only went to Bulgaria once and just loved Nesebar. Greetings Inka! So wonderful to see you again my friend! Hope all is well. Thank you so much for stopping by and for all of your kind words!! Wonderful post, Jeff. 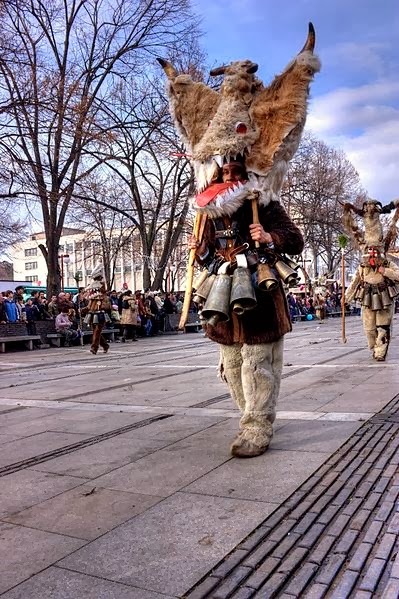 The architecture in Bulgaria is astounding and the holiday kukeri costumes both frightening and fascinating. I think that National Geographic magazine ran an article on these and other European animal-based costumes with their origins in the mists of time. Hi there Lesley and thank you so much for stopping by!! How interesting that NatGeo ran an article on these, I have never heard of them before until Kristian pointed them out. Love how you describe the origins as being from the "mists of time." Sounds intriguing! Learning a lot from this series, Jeff. Surprised that Easter's larger than Christmas. The Koledari carolers just brought back a memory. When I was about 9 or 10, I'd go with my cousins to sing carols. From about the end of November to Christmas Eve, we'd wake up around 5 and go house to house singing carols. I hadn't thought of that for years! Thanks for bringing this back to me. Hi there Marcia! Thank you for your kind words my friend. I am thrilled to have taken you back in time to your Christmases past. Must have been a wonderful time caroling! What a great introduction to Bulgarian Christmas. I have traveled through Bulgaria a few times, but never thought of it as a country with Christian traditions. Hi there Mette! I too was fascinated when I learned of these Bulgarian Christmas traditions from my friend Kristian. He really opened my eyes to a whole new world in Eastern Europe! Thank you for stopping by and sharing your thoughts! Great site! Just to contribute to your article. I have spent one Christmas in Bulgaria and is something I will remember forever. All you mentioned was on the table and my "bulgarian family" did the rest. The warmness from this people is awesome. I recommend to everybody to visit Bulgaria, not only on Christmas. So much to offer.. Thanks to allow me and congratulations for your site! Hi there Juan Carlos and thank you so much for sharing more insight into spending Christmas in Bulgaria and the warmth that a family can contribute to the celebration! I totally agree! If you want a German Christmas tradition, go to Germany. Otherwise, enjoy what Bulgaria has to offer. Europe as homogenous is no fun!